SuperSlow is a high intensity, low-force exercise method. It is the method that best fits the definition of complete exercise. It is beneficial for rehabilitation, bodybuilding, weight loss, and general exercise. SuperSlow total-body workouts are performed once or twice a week, depending on the patient/client's strength and skill levels. Our value driven program is singularly focus on results achieved by our clients. An approximate 20 minute strength training workout. A workout performed once or twice per week. Since its inception in 1982, SuperSlow has received worldwide acclaim as the model program for definitive strength enhancement, improved general health, ensuring true fat loss, and it is the ideal protocol for physical therapy rehabilitation. SuperSlow strength training is implemented under the watchful supervision of SuperSlow certified exercise specialists, utilizing state-of-the-art equipment built exclusively by SuperSlow Systems Inc., designed according to proper muscle and joint function. Busy people everywhere are reaping the benefits of SuperSlow, which demands only 20 minutes of their time, one or two times per week, by appointment only. The SuperSlow exercise protocol is an efficient and effective workout in which general exercisers give their maximum effort. The cornerstone of SuperSlow is an approximate 20-second cycle of each repetition from the beginning to the start of the next repetition. The weight is lifted in 10 seconds and lowered in 10 seconds coupled with a smooth turnaround technique. Clients complete approximately two to three minutes on the equipment until they reach momentary muscular failure. At that moment, the SuperSlow certified instructor will encourage one last attempt. It is that last effort that successfully stimulates muscles to improve. This method truly embodies the definition of complete exercise by properly and safely building muscle and increasing the resting metabolism, allowing the body to burn more calories even while at rest. SuperSlow addresses three key elements for a complete, results-driven workout. Working maximum muscle fibers in high-intensity, low-force exercises encourages maximum muscular strength. The program demands the application of resistance through a full range of possible movement, with adequate stretching to enhance and maintain flexibility. SuperSlow requires greater demands on the body's transport system, thus promoting increased cardiovascular efficiency. More than any other program in the industry, SuperSlow is unsurpassed in directly and safely addressing the three components of physical conditioning. Between the ages of 20 and 50 the average individual loses approximately 15 pounds of muscle and gains over 30 pounds of fat as a result of the decrease in metabolism associated with muscle loss. In addition to improved strength and endurance, regaining or building muscle tissue also increases metabolism, improves body shape, bone density, cardiovascular efficiency, and joint stability. SuperSlow strength training can quickly and easily stimulate the body to produce additional muscle tissue and improvements in cardiovascular and other support systems. It is important to note that SuperSlow is the stimulus, and the physical improvements are produced by the body as a response to the stimulus. Dramatic results from two 20-minute workouts a week? Absolutely. SuperSlow is a revolutionary exercise regimen that give you a leaner stronger body in less time than you'd take changing your clothes at an ordinary facility. When a muscle is pushed, by slow continual force, or weight resistance, past total fatigue, a signal or "stimulus" is delivered to the body: "Make more muscle." If the body is given proper nutrition and adequate rest, it will produce more muscle. Muscle is, of course, the primary determinate of our body shape. 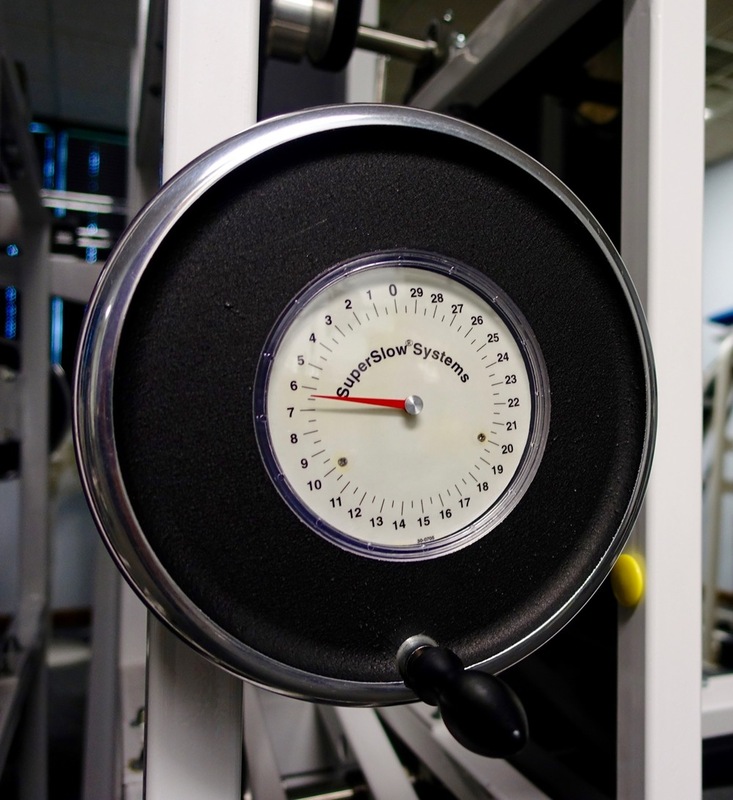 Time between workouts is physiologically essential for building lean muscle. You're basically building muscle on the days between workouts. So what is this 20 minute workout like? A typical SuperSlow workout involves four to six weight machines, each targeting a specific muscle group. Weights are slowly raised in 10 seconds and lowered in 10 seconds non-stop until the targeted muscles reach total momentary fatigue - about 1.5 to 3 minutes per machine. The turning point comes when you try to push beyond total fatigue for an extra 10 seconds. That is what triggers fast, noticeable improvement.